Displaying artworks in galleries with complimentary aromas seems to be a growing trend and one I’d like to explore. There is currently a ‘Sensorium’ at Tate Britain in London, where IFF perfumers have worked with Odette Toilette to scent a number of paintings as part of a multi-sensory experience. Over in the States, indie perfumer Dawn Spencer Hurwitz has created the “In Bloom – Scent Experience” for the current Impressionist and Post Impressionist flower painting exhibition at Denver Art Museum. This is their eighth collaboration. In the exhibit, three of her accords are spaced around the gallery to create a surround scent impression of Monet’s beloved garden in Giverny, France. These accords are available as three separate fragrances through DSH Perfumes (Le Jardin Vert, La Danse des Bleus et des Violettes and l’Opera des Rouges et des Roses). The perfume Giverny In Bloom has also been released which ties the three together and encapsulates the overall aroma created at the exhibit. When working on the fragrance, Dawn used information about the actual garden as well taking inspiration from the paintings. I think DSH Perfumes are particularly good for green fragrances. Le Jardin Vert is another example; chock full of galbanum, moist and vivid. It’s brimming with sap-filled stems, grass, leaves and just underneath, a hint of mineral-rich soil. Here we have the backdrop of variegated vegetation that enables the flowers to shine. A cool, bluish purple hue is created by a bed of violets, irises and lilacs. The centrepiece is a blanket of violets which are fresh and very green to start with, creating a dewy bouquet with lots of foliage. The dry down is deepest indigo and velvety smooth. This is a striking display of exceedingly spicy carnations accented by vintage roses and blousy peonies. These are the eye-catching showstoppers whose hot pink and red petals draw your attention. Their scent is just as arresting and creates a sense of drama. The three scents above combine in Giverny in Bloom to paint Monet’s flower garden in various olfactory shades of green, blue and red. It’s interesting to experience the whole panoramic aroma after sampling the component scents. The effect is actually softer although fuller than the separate strands. All three accords are seamlessly woven together to re-create the garden at Giverny. This makes for a gorgeously lush, green floral fragrance. I’m just as aware of the greenery – that is the very foundation of the garden – than I am of the flowers that intersperse it. Like the paintings, the overall effect is impressionistic with blurred edges and more muted shades than the constituent parts, but together they bring a complete garden into being. Giverny in Bloom radiates colour and plant-life in soft focus. How do you feel about scented art experiences? Have you been to one? This entry was posted in By Tara, DSH, Fragrance Reviews and tagged Dawn Spencer Hurwitz, DSH Perfumes, Fragrance, Perfume, Review. Bookmark the permalink. I wore my Giverny In Bloom sample and immediately got in touch with Dawn to order a bottle. It has become my favourite green surpassing Nikki de Saint Phalle, Silences and CHANEL No 19. Something I never thought could happen. What a fabulous fragrance. Great piece BTW, you get fragrance so much better than I.
Portia, that is such high praise. Wonderful. Dawn has a real talent for creating green fragrances. I’d like to get hold of quite a few of hers and find my favourite. I know my ideal green is waiting for me in her collection. It’s not easy ordering from the UK though. I really don’t get fragrance better than you Portia, but thanks for being so sweet. I would love to see more cross overs in art and perfume. Events like this seem to happen in Paris, London and New York but not so much further afield. I’m in Edinburgh and we did have one event organised by a poet friend which took place in the Victorian Palm house at the Botanic Gardens. Poems were chosen for each perfume, the perfumes were displayed on linen cloth in antique tea cups, poems were recited and there was live cello and guitar music. It was so beautiful! I occasionally create paintings inspired by perfume, and I’d love to organise a collaborative event, but I’d need funding to do it properly and my time’s already taken up with art/poetry collaborations and funding etc. Good for DSH Perfumes, Giverny in Bloom sounds wonderful! That poetry event sounds really special. How great that you got to experience that in the Botanic Gardens. This kind of cross overs will happen more and more so maybe department stores will catch on. It’s fabulous that this is the eighth collaboration Dawn has done with Denver Art Museum. The exhibition sounds amazing. These scents go on my must try list. Thanks for a wonderful review! Thanks for stopping by rickyrebarco! I would love to visit the exhibition. How cool to be able to smell the garden you’re looking at in the paintings. I love art and perfume collaborations( not really a surprise…..) and I will go and the the one at the Tate. Of the DSH scents it’s the blues and purple one that appeals the most to me. The Sensorium is really popular and the tickets each day go fast, so visit in the week if you can. It’s supposed to be fab. I was aware of the thing at the Tate, and thought it sounded very interesting, as does this, especially for Monet fans – it brings a whole other sensory overlay to proceedings. In your review I particularly like the phrase ‘radiates colour and plant-life in soft focus’. And like Sabine, I am most drawn to the blue scent of this series, as I am a bit ‘off’ galbanum at the moment after failing to bond with the reworked Patou Vacances! The “blue” scent is lovely and completely wearable. I think some might struggle with the spicy carnations in the red one. You make them all sound lovely, and it made me think again how I would love to go to Giverny one day, it must be incredible. I have a fondness for Monet too and agree it’s a shame his work is seen by some as being a bit naff because of those posters. I’m also always inspired by artists who were sight impaired. You’re right; you really get a true sense of how affecting his work is when you see it in the intended scale. There are a couple of huge paintings of the waterlilies at Tate Modern. I think you’d love the red one as you get on with super spicy carnations. The peony is just an accent. 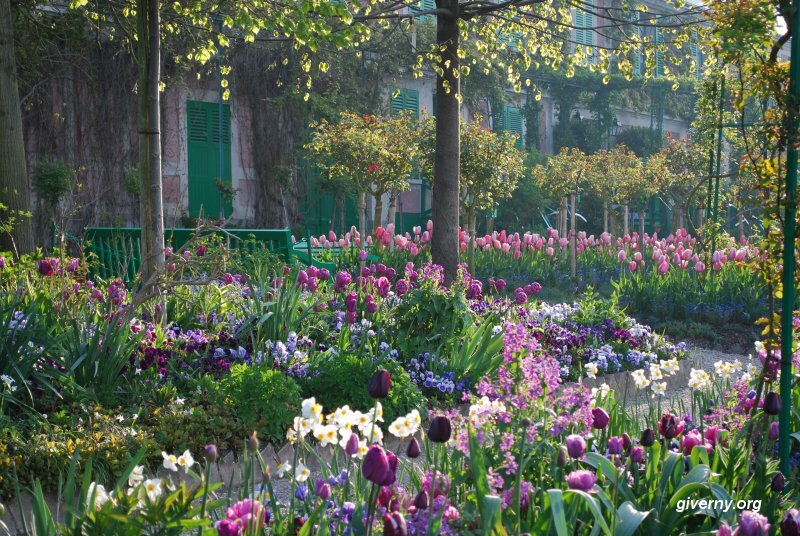 I’d love to visit Giverny one day too.